Check out the dawn sky on Friday morning, January 16. You will see a slender crescent moon just above the planet Saturn. There are always interesting and unusual things to see in the night sky, even if you don’t own a telescope. 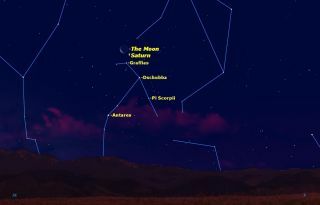 Saturn, the moon and several other night sky objects are currently starring in a celestial show before sunrise, but only for those early birds who know when and where to look. A case in point is this Friday morning (Jan. 16), just before sunrise, when early risers looking southeast will be treated to the sight of a slender crescent moon and the planet Saturn. If you watch the sky over several nights, you will notice that the objects you see move in various different ways. Everything in the sky appears to move from east to west as the Earth rotates. The moon moves from west to east against the background stars and planets. The planets, meanwhile, move in complex ways depending on the combined movements of the planets themselves around the sun, and the movements of the moving platform from which we observe them: Earth. At present, Saturn is moving slowly from west to east through the northern part of the constellation Scorpius. This is one of the rare groupings of stars that actually looks like its namesake, a scorpion. The bright red giant star Antares marks the heart of the scorpion, with a long curving tail below and to the left and grasping claws above and to the right. Saturn is poised just above the uppermost claw, marked by the star Graffias. Anyone with a small telescope should take a look at Graffias. It is a double star, its two main components, 13.5 arc seconds apart, easily split by even the smallest telescopes. The brighter of the two components is itself a double, at 3.5 arc seconds also resolvable in most small telescopes. Saturn is always worth a look with all but the smallest telescopes. Its famous rings are now tipped towards us, visible in any telescope able to magnify more than 25 times. At least one of its moons, Titan, should be visible in any telescope, with half a dozen more appearing in larger amateur scopes. But even without a telescope or binoculars, the crescent Moon, Saturn, and the bright stars of Scorpius will make a fine sight for early risers.